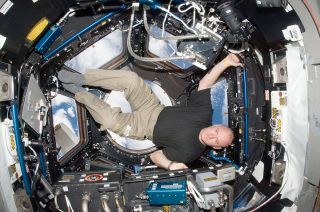 NASA astronaut Scott Kelly is pictured in the windowed cupola of the International Space Station in October 2010. He will return to the space station for a yearlong mission in March 2015. NASA astronaut Scott Kelly has just a year left on Earth. A veteran space station commander and half of history's first pair of twins to fly into orbit, Kelly will leave the planet in 2015 to become the first U.S. astronaut to spend a year in space. The American and Russian are assigned to launch aboard Russia's Soyuz TMA-16M spacecraft on March 28, 2015, from the Baikonur Cosmodrome in Kazakhstan. "Posting daily tweets as I prepare to leave the planet for a year," Kelly wrote on Twitter. NASA astronaut Scott Kelly and Roscsomos cosmonaut Mikhail Kornienko will work for a year on the space station. NASA hopes to use the data collected during Kelly's and Kornienko's stay to help in the planning for future crewed missions beyond Earth orbit, including sending astronauts to the vicinity of the moon, to a redirected asteroid and out to Mars. For the first 13 years it has been continuously crewed, the space station has hosted astronauts and cosmonauts for expeditions lasting about six months, at most. Kelly's and Kornienko's yearlong mission, which will concurrently take place with other crewmembers' half-as-long stays, will help further inform researchers on the effects microgravity has on bone density, muscle mass, strength, vision, and other aspects of human physiology, NASA officials said. "This one-year mission opportunity will show if the trends continue as before or if we are approaching any 'cliffs' that will require new treatments while providing new insights," said John Charles, the chief of NASA's Human Research Program's International Science Office at Johnson Space Center in Houston. Although the mission will set a new duration record for the International Space Station (ISS), it will be the third time in history that humans have spent a year or longer in orbit. Four Soviet-era cosmonauts logged (at least) 365 days off the planet while living aboard the Mir space station during three missions spread out between 1988 and 1999. "This [yearlong ISS flight] will build on the rich experience of long-duration flights, including the four flights of a year or more conducted by our Russian colleagues on the Mir station," stated veteran astronaut Michael Barratt, former program manager for NASA's Human Research Program. "We have progressed considerably in our understanding of the human physiology in space and in countermeasures to preserve bone, muscle and fitness since then." Kelly also brings an additional 54 days of space travel to the mission, in the form of his identical twin brother. Now retired from NASA, Mark Kelly flew four shuttle missions, including commanding Endeavour's final flight. Together, the Kelly brothers — Scott in space and Mark on Earth — will take part in twin-focused experiments as a part of the yearlong mission's science objectives. Kelly and Kornienko will arrive at the space station during the outpost's 43rd expedition and stay through Expedition 46. Kornienko will serve as a flight engineer throughout the year, while Kelly will serve as the station's commander for the second half of his stay.